Colombia is the world’s third-largest producer of coffee and the only country that grows Arabica beans exclusively. The bean was brought to Colombia in the early 18th century by Jesuit priests from Venezuela. The land around Pereira is perfect for the cultivation of coffee bushes: rolling overgrown hills between two mountain ranges with rich volcanic soils and great rivers like the Quindío. The heavy rainfall in the winter usually means that there are two coffee harvests each year. All beans are handpicked by farm workers who travel around the region working at different locations as the harvest matures. The fruit around the bean is removed before drying, which removes much of the acidity. 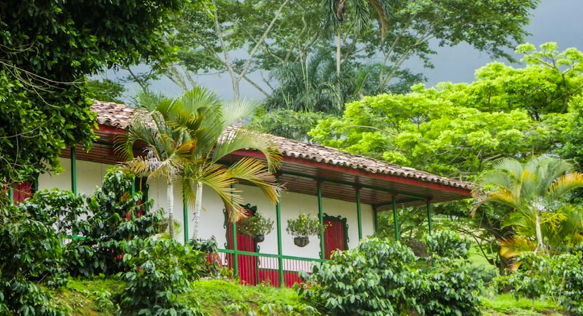 We’ll then travel south to the Hacienda San Alberto, where we’ll learn about the coffee industry, including exporting and all the steps involved from growing to brewing. We’ll sample coffee brewed with different methods while gazing out on the coffee groves that blanket the countryside. We’ll lunch today at a scenic local restaurant. In the afternoon, we’ll travel to Salento, a quaint town with colonial architecture that will be our base for travel to the Cocora Valley. We’ll take a gentle walk in the valley, which is filled with native wax palms, the tallest palm trees in the world. Bird life is a big draw in Colombia, which has more species (almost 1,900) than any other country, and the Corcora Valley is a perfect area for bird-watching. While we’re here, we’ll likely see motmots, which have tails like a pair of badminton racquets and brilliant turquoise eyebrows, plus bright-green jays and plenty of toucans. We’ll return to Pereira for dinner.